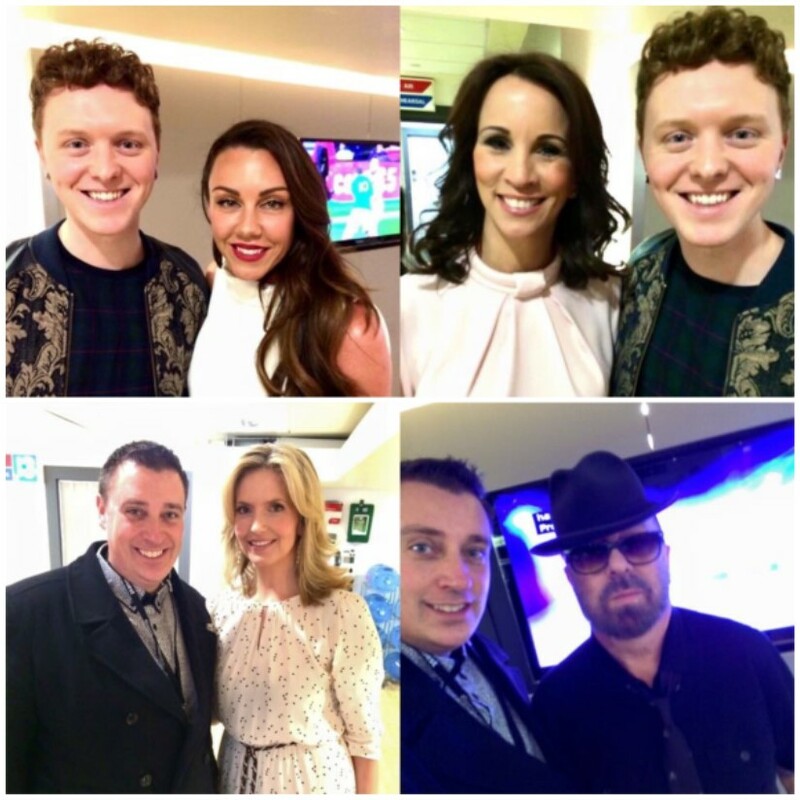 Wyburn: It’s been a super busy month for me and my artwork… We got to meet and chat to some of the Loose Women whilst my pizza art portraits of Ant & Dec were being filmed for Saturday Night Takeaway in London! That was pretty cool… I also got to present American singer and Rupaul’s Drag Race judge Michelle Visage with her portrait created in make up at their show in the Tramshed, she loved it! Wayne: Don’t forget Gabrielle! Omg we had the honour of meeting her after her show in St David’s hall alongside Michael Bolton. We chatted for ages whilst sipping champagne, it was so showbiz and she loved your coffee portrait of her! Other shows we’ve had the pleasure of enjoying this month include Rick Astley, who we previously interviewed – he rocked St David’s Hall, what a gig!! Wyburn: I loved it, amazing to see so many people up on their feet and dancing! St David’s Hall has become like a second home the past few weeks as we also got to see comedian Julian Clary! He’s one of my favourites and was on top form that night! I haven’t laughed so much in ages! Wayne: I know! Incredible show! 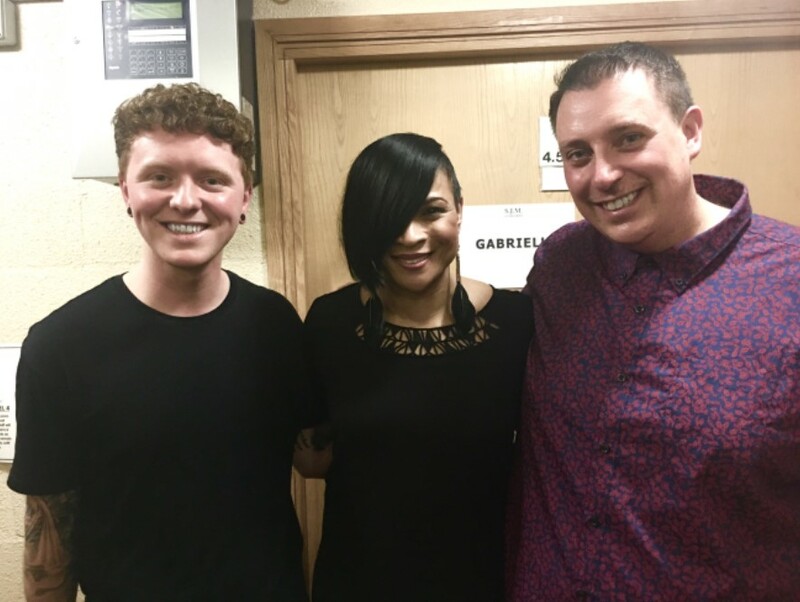 We also attended the Pride Cymru fundraiser in Cardiff Student Union which was a great show headlined by Lucy Spraggen alongside Tom Auton, Mary Mac & Jolene Dover! They also know how to party don’t they? 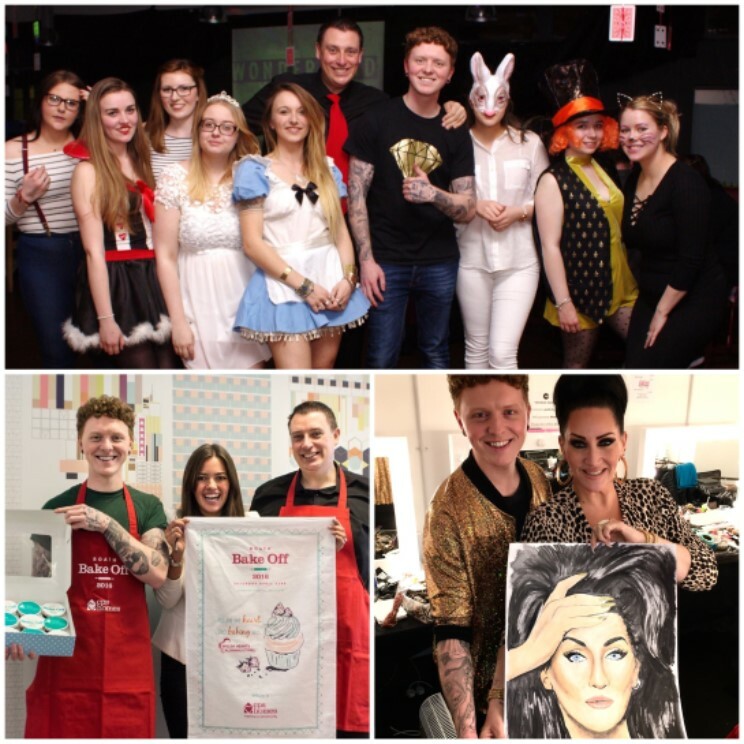 Wyburn: It has been quite the party month to be honest, we also loved the fundraising event put on by students at the Llandaff uni campus called “Down the rabbit hole” which was an Alice in wonderland theme! Again, amazing live music from the likes of James Evans and Cristian Perugino, and who can resist a chocolate fountain? Yummy! Wayne: On the topic of food…there’s been some wonderful restaurant openings and events this month! The Dock down the Bay opened in style with a trip down the Taff on the aquaboat sipping cocktails and samples of the brilliant menu by chef Nathan Brown! Amazing new turn for a Brains pub and exciting to see the direction it’s going! I also got pretty tipsy enjoying a tequila evening at Chiquitos. Wyburn: You did! Gutted I had to miss out on that one, you seemed very merry in your snapchats Wayney! Haha. Not to forget the launch of Le Monde’s Afternoon Tea menu on the Queen’s 90th! I’m a sucker for a clotted cream and jam scone, so I had about 5! Again, this month has been full of charity events! Kicking off with us hosting the Easter bunny fun run at Llandogh Hopsital, where I exhibited my art for the week running up to it, to help promote and sign people up for the event! A huge congratulations to the winners and everyone who took part! Wayne: That bunny was a little scary mind… I loved seeing all the fancy dress costumes, it makes such a difference to see everyone enjoying and going all out!! Well done to the organisers and thanks for having us on board!! Wyburn: Our ongoing work with the Prince’s Trust Cymru continued and we attended their event in Cardiff centre for their 40th celebration tour! We also helped 3 lads who were taking part in he Red Bull Can You Make It? Challenge of traveling quite some distances for free on the generosity of people, flights, travel and hotels! We managed to get the 3 lads (from Austria) a free Capital Cab from central to Cardiff Airport to continue their journey, so good on you Capital Cabs! Wayne: Those guys are awesome, living the dream! And of course, The Roath Bake Off has come around, we spent a whole day delivering cupcakes from CPS homes (our sponsors) to worthy nominated hard working people within the community! It was a hugely rewarding day and we put smiles on many faces! We’ll be back next month with all the gossip from the Bake Off and loads more!! 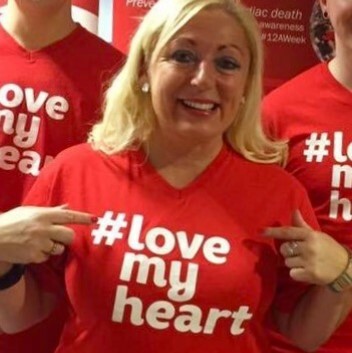 Occupation: Charity Director for Welsh Hearts. Fave place to eat in Cardiff: Il Pastaficio Italian Restaurant. Fave bar in Cardiff: Park Plaza. Cardiff in 3 words: bustling, buzzing and beautiful.